Seamus Coleman has reportedly attracted interest from Man United. ON THE SEVEN occasions Jose Mourinho’s sides have been top at Christmas over the course of his career, they have gone on to win the league on each occasion. The Portuguese boss simply does not let leads slip easily. Man United and Liverpool are both still in transition while Arsenal are as reliably unreliable as ever, leaving Man City as their only genuine challengers to the league title. However, the January Transfer Window may turn out to be more important than many people assume in the title race. Chelsea and City may boast world-class strikers in Diego Costa and Sergio Aguero but both tend to be quite injury prone, and the back-up up front is far from exemplary – Didier Drogba is no longer the force he once was while Manuel Pellegrini’s side had to play James Milner in the most advanced role recently. City also have the advantage over Chelsea in terms of collective experience in competing in a title race, but that said, the Londoners look a better balanced side and appear to have that slight bit of extra quality that should carry them over the line. Last season, Man United failed to qualify for the Champions League for just the fourth time since the competition’s inception and the first time since 1995-96 season. Hence, the above prediction was more or less a given until recently. United started slowly under Louis van Gaal and still have problems — most notably in defence — currently. And this season appears to be one of the most open in years, with Liverpool and Tottenham improving after difficult starts and Arsenal there or thereabouts as usual, not to mention dark horses in the form of West Ham and Southampton also going strong (for the purposes of simplicity, we’re assuming Chelsea and City have the top two sewn up). Nevertheless, out of all the contenders, United surely have the strongest squad (or at least the most expensive one owing to their summer spending spree), and they’ll likely only get stronger once their high-profile players come back from injury. Moreover, with one or two solid additions in January, third place should certainly be a viable aim. Despite somehow not making the Monday Night Football Team of the Season so far, Cesc Fabregas has been comfortably one of the most influential players in the Premier League so far this season, and would be an obvious candidate for any player-of-the-half-season award. In the Premier League alone, he has racked up 14 assists — six more than second-placed Gylfi Sigurdsson — and has contributed two goals to boot. Furthermore, Fabregas has played the most passes, touched the ball more times than anyone else and created the most chances. Past award ceremonies tell us that players tend to value these type of statistics more than anything else — the player-of-the-year runners-up last season — Yaya Toure and Steven Gerrard — were similarly influential in terms of assists, while the winner — Luis Suarez — scored more goals than anyone else. Hence, barring an improbable drastic loss of form or season-ending injury, Fabregas appears strongly placed to collect the award come May. The Donegal native had a largely excellent 2014. He was the Toffees Player of the Year and was named in several teams of the season, including the official PFA one. Nevertheless, like the rest of his Everton teammates, he has struggled to recapture such scintillating form this season. Consequently, perhaps it is time Coleman sought a fresh challenge, and there would certainly be no shortage of takers should Everton decide to cash in on one of their most prized assets. Moreover, if the full-back is to develop into a truly world class talent, he needs to be playing Champions League football on a regular basis — something Everton don’t look likely to achieve in the near future. If the Premier League was based purely on talent, Burnley would undoubtedly be relegated and would also probably finish last. However, manager Sean Dyche is undoubtedly acutely aware of his side’s limitations. The Turf Moor outfit, consequently, have adopted a conspicuously pragmatic game — they know they will be without the ball more often than not against most teams, and therefore, they have wisely decided to base their game around running and work rate instead. Few teams are fitter than the Premier League strugglers — the stats back this up, as they are invariably hovering around the top of the charts in terms of distance covered by teams, and one of their players, Scott Arfield, has made more sprints than anyone else in the league. Such sides often cope well in relegation battles, as regularly, the simple, direct and relatively risk-free style tends to pay off when teams come under extreme pressure. Amid Tottenham’s infamous post-Gareth Bale summer of excess, their best buy by far has ironically turned out to be one of the club’s less high-profile signings. Whereas other expensive youngsters, such as Eric Lamela, have struggled at times since joining, Eriksen almost immediately looked at home in the Premier League. Only Yaya Toure was involved in more goals (i.e. either scored or made an assist) in 2014 than the 22-year-old Dane. Traditionally, as was the case with Luka Modric and Gareth Bale (and going back further, Michael Carrick and Dimitar Berbatov), Spurs have tended to sell their best players. If Eriksen keeps playing the way he does, those rumours of a move to PSG or another big club could become concrete sooner rather than later. Steven Gerrard has been undoubtedly one of Liverpool’s best ever players, and there will be an obvious void that the club captain will leave once he departs at the end of the season. Already, however, talk has turned to the players who could potentially replace the club legend. Fabian Delph, Morgan Schneiderlin and Alex Song have been among those mentioned to take over from Gerrard in the sitting midfield role, but the club may strongly consider promoting from within. Emre Can has hardly set the world alight since joining Liverpool from Leverkusen, but most foreign players have difficulty adapting to English football initially, and the talented youngster is no exception. Moreover, the Reds hardly expected immediate results when they paid £9.75million to prise away the German midfielder from the Bundesliga. After all, Can is only 20 and still needs time to adjust to this challenging situation. And while playing alongside an experienced pro such as Gerrard would have been good for his development to a degree, it seems reasonable to assume he could start to flourish in his absence. It wasn’t until Roy Keane’s departure that Darren Fletcher really thrived at United, and Can may also grow in confidence and fulfill his undoubted potential without the presence of a club legend constantly overshadowing him. What are your Premier League predictions for 2015? Let us know in the comments section below. 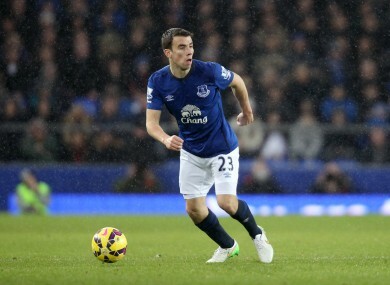 Email “Seamus Coleman to get a big move and 6 other Premier League predictions for 2015”. Feedback on “Seamus Coleman to get a big move and 6 other Premier League predictions for 2015”.